Striped and spotted cucumber beetles and squash bugs are very damaging pests of cucurbit crops (such as cucumber, pumpkins, squash, watermelons, and muskmelons). Managing these pests in gardens and small farms can be challenging. 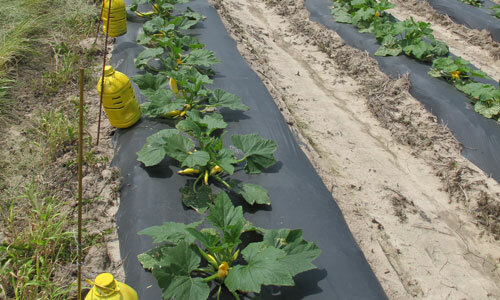 This article discusses trap cropping and mass trapping, two Integrated Pest Management (IPM) strategies that you can use to control cucumber beetles and squash bugs with little or no insecticides applied to the cash crop. Trap cropping means using very attractive plants growing in the perimeter of the garden or cucurbit field. These attractive plants pull the pest away from the cash crop. Insects congregated on trap crop plants can be more easily killed with insecticides or by other means. Research conducted by the Lincoln University (LU) IPM program since 2011 indicates that Blue Hubbard squash is a very attractive plant to cucumber beetles and squash bugs and therefore it is an excellent trap crop plant. By using trap cropping, farmers have reduced inputs (fuel, labor, time, and insecticides) and they have increased income while protecting pollinators and other beneficial insects. 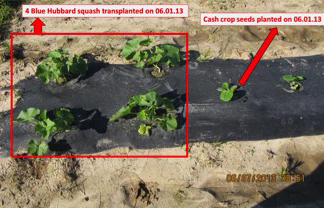 As an example, one producer from St. Peters has not sprayed any insecticides to his cucurbit cash crop since 2011. He only applies a small amount of insecticide to the Blue Hubbard seedlings shortly before transplanting them to the corners of his fields. He currently sells his cucurbit produce as insecticide-free. 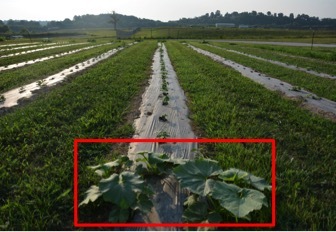 Blue Hubbard squash plants (larger plants on left) used as trap crops planted at both ends of each row. Using trap crop plants is easy and inexpensive. In Central Missouri, mid-April is the time to start growing Blue Hubbard squash transplants. The key is to transplant 2-week old Blue Hubbard seedlings (trap crop plants) to the field at the same time you sow the seeds of your cucurbit cash crop. If you grow your cash crop from transplants, then you will need to transplant the Blue Hubbard seedlings at least 2 weeks before your cash crop. 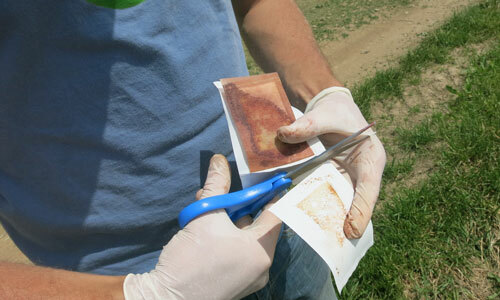 A second piece of advice is to use an insecticide to kill the insect pests on the trap crop plants. Remember, having 1-2 cucumber beetles or squash bugs on your cash crop doesn't mean that you need to spray. It may be possible that you don't have to spray insecticides to your cash crop at all! Our research has demonstrated that for a small garden of 100 or so cucurbit plants, you can be successful at controlling cucumber beetles and squash bugs using 6-8 Blue Hubbard squash plants. For a small farm, if you grow cucurbits using plastic mulch and drip irrigation then we recommend you transplant 2-4 Blue Hubbard squash seedlings to both ends of each row (see pictures below). (A): Protective wings of the AgBio lure being removed - to aid in scent dispersion. 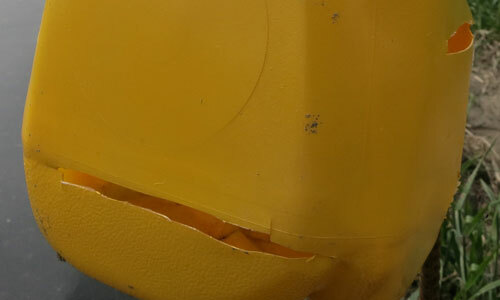 (B): Lure being inserted through the mouth of a yellow-painted milk jug. (slits about ¼ inch). (C): Trap deployment in a zucchini field (Lee Farms, Truxton, MO). The LU IPM program recently developed a simple, mass trapping system that has proven to be an effective component of an IPM strategy to control cucumber beetles. When deployed in a cucurbit field, both striped and spotted cucumber beetles are drawn to the traps and away from the cash crop. Upon entering the trap, the beetles are killed by their consumption of an insecticide-laced bait. However, this mass trapping system won't control squash bugs. If squash bugs are the main pest in your garden / farm, then we suggest using trap cropping. The three components of the trap are: (1) a juice / milk jug, (2) a commercial, floral-based lure (or attractant) (source: AgBio© Inc., Westminster, CO; phone: (303) 469-9221), and (3) a commercial "stun pill" (that kills the trapped insects) composed of an insecticide, paraffin wax, and powdered buffalo gourd. 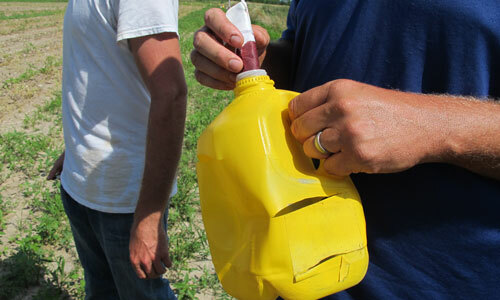 The pictorial below shows (A) the protective wings of the AgBio lure being removed – to aid in scent dispersion, (B) lure being inserted through the mouth of a yellow-painted milk jug, (C) trap deployment in a zucchini field (Lee Farms, Truxton, MO), and (D) the various ways entrance holes (for the beetles) that can be made. 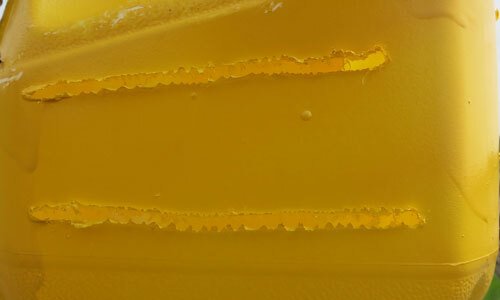 Results from research conducted from 2011 to 2013 at the LU George Washington Carver Farm indicated that yellow-painted traps baited with the commercial AgBio© floral lure performed best. In 2011, 28 baited traps killed 2,531 cucumber beetles (combining striped and spotted) in a watermelon crop over a 9-day period. This combined reduction of spotted and striped cucumber beetles reduced the need for an insecticidal spray while maintaining production of marketable fruit. In 2015, on-farm research on mass trapping conducted at one commercial vegetable farm located at Truxton MO, indicated that 28 traps killed 3,715 cucumber beetles (combining striped and spotted) over an 8-week period (21 May - 9 July). Overall, the level of beetle suppression was so effective that the number of insects found on plants averaged 0.42 per plant, a number that is below what is called an economic threshold (= pest density at which insecticide applications are justified). 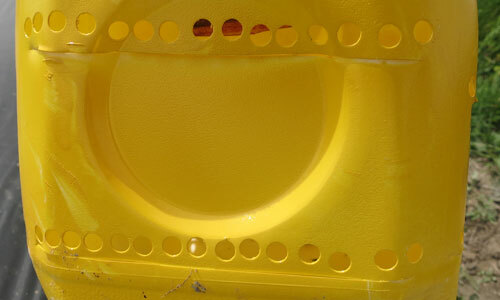 (D): Various ways beetle entrance holes can be made: hole punch, rotary tool and by using a knife. Results gathered over multiple years in various locations indicate that the mass trapping system developed is effective at suppressing striped and spotted cucumber beetles from cucurbit plants. Some producers in a couple of Missouri locations are currently evaluating the performance of this novel mass trapping system. Overall, our 2015 data indicate that, across the entire trapping period, for each cucumber beetle found on a plant, there were 26 cucumber beetles killed by a trap. In 2016, 15 traps killed 3,217 striped cucumber beetles in a 6-week period. For more information on mass trapping, go to the LU IPM program webpage: https://www.lincolnu.edu/web/programs-and-projects/ipm or to the MU IPM program webpage https://ipm.missouri.edu/IPCM/2016/6/A-novel-mass-trapping-system-to-control-cucumber-beetles-in-cucurbit-crops. Funding for trap cropping research was provided by the Ceres Trust: An Organic Initiative (http://cerestrust.org/), and by the USDA/National Institute of Food and Agriculture (NIFA) Capacity Building Award No. 2011-38821-30867. Funding for mass trapping research was provided by the North Central Region IPM Center through Sub-Award # 2007-04967-35 and by the USDA/NIFA Capacity Building Grant program, Award No. 2011-38821-30867.